Finance Info: What Documents Are Required? Team SUZUKI ECSTAR concluded a positive day of testing in Jerez de la Frontera in Spain today; the team’s final testing until 2017 with factory riders. Following last week’s test session in Valencia, the team travelled to the Andalusian circuit with new factory rider Andrea Iannone and Team Suzuki Test Rider Takuya Tsuda, who substituted for Alex Rins, who is still recovering after the injury he suffered during last week’s crash. The cold temperature of Jerez didn’t allow the riders to push to their limit, but the main objective of the test was not to chase the time attack but to test many things that were useful to determine the development over the winter. In particular, the focus was on different specs of the engine in order to find the best direction according to the riders’ needs. Iannone made impressive work on this, giving the engineers important information to work on, while Tsuda focused more in testing different settings in electronics and collecting a lot of data. Thanks to the positive work done today the full testing program for Iannone was already completed, so he will not ride any more before the first official testing of 2017 at the end of January in Sepang. The Team will stay in Jerez for more testing with Tsuda. “We achieved a good result in making the whole testing program in only one day with Iannone. After having lost the concessions we want to save testing days for the future and having completed all the tests we needed we won’t have him ride more. Our purpose here was not the chase to the fastest lap but to allow him to improve his feeling with the machine and help us to determine the future development. We brought here some different specs of the engine that he tried, and he gave us the direction to take in the winter. We will not develop a brand new engine for 2017, we will develop an evolution of the actual engine and Andrea gave us the feedback we needed to understand which character of the engine to develop, according to his experience and needs. He did a great job today, very intense until the very end of the available track time, and we must thank him for this contribution. “We have here our test rider Tsuda, who is focusing more in collecting information for the electronics development. We are trying to find a better efficiency in our settings and we will continue this work with him also tomorrow. The objective of course is to gain experience and find more options. I think it is fair to say that the Taiwanese manufacturer is better known for its range of quality scooters than for its motorcycles. I was therefore intrigued to see how the 250 Wolf would shape up. Whilst new to the South African market, the Wolf has been sold internationally for 4 odd years. 250cc motorcycles generally don’t cut it for commuting duties in South Africa. They are ideal for commercial application, but are somewhat lacking when highway travel is required. The largest commute in S.A. is between Jozi and Pretoria. Hundreds of thousands of people move daily between these two cities, creating traffic chaos which up to ten years ago was relatively rare. A similar scene unfolds in Cape Town with commuters travelling into the city from all directions. Adding to that challenge is “that mountain”! Durban has a similar issue with freeway gridlock most mornings and evenings. So, what is the solution? A motorcycle, that’s what! It is legal to filter through traffic is S.A. If you own a motorcycle with tidy dimensions (not an adventure mother ship with panniers and top box) commuting becomes really easy. Problem is 250cc bikes are generally to slow for safely maintaining highway speeds. To stay safe in highway traffic you must be able to outperform the cars around you. You can ride in a pro-active rather than reactive way. How does the Sym Wolf cope with freeway traffic? Let me tell you. The Wolf goes through traffic faster and more efficiently than Zuma through taxpayer’s money! I commute on a Honda CRF 250L. To help the Little Honda compete on the freeway I fitted a full FMF exhaust and K + N air filter. These mods up the power by an incredible 20%. The Sym, stock standard, will absolutely blow the radiator right off my Honda. It is quite bulky for a 250 at 113kg, yet with 26 horsepower at 7,500 rpm and 23.1 nm of torque @ 6,000 rpm it is a little flier. At redline (9,000 rpm), it indicates 120kph in forth, 135kph in fifth and with my 84kg frame tucked in behind the tiny fly screen, 160kph in top gear. Fantastic performance for a water cooled, fuel injected four stroke single. The motor has a characterful thrum. At all speeds under 7,500 rpm it is really smooth. Only the last 1,500 rpm induces anything resembling vibration. At 120kph in top it is revving at about 6,600 rpm and dynamo smooth. It will run comfortably for days on end at this speed. I would love to tackle some tiddler touring on the little Sym. The bike exudes a robust, big bike feel and is stable and confidence inspiring at all speeds. Suspension is non- adjustable for damping, with only rear preload adjustment. The factory has dialled in the settings superbly. 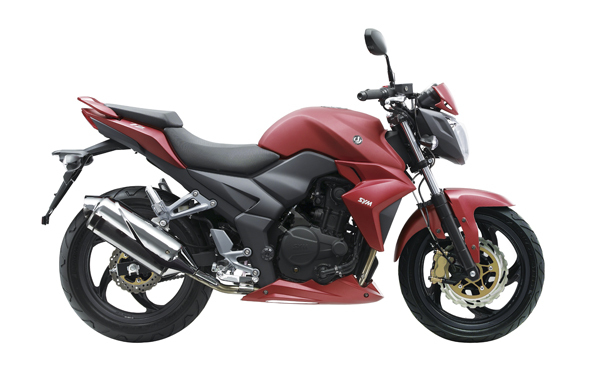 The ride is firm and controlled with no loss of composure even when taking on bumpy roads at speed. A 288mm front disc, chomped on by a four pot calliper assisted by a 222mm single piston rear, stops the Wolf quickly and without fuss, providing plenty of feel. What really amazed me was the broad spread of power from the 250cc mill. There is no need to thrash it through the gears. 6,000 rpm through the gears will see you outpacing general traffic with ease, and once in 6th you seldom need to drop a gear. It was actually a challenge to rein the little beast in to cruise at 120kph. It loves to cling to 7,000 rpm and just shy of 130kph. Topping up the tank showed, despite my enthusiastic use of the throttle, fuel consumption of 34kpl. The 14L tank will take you damn near 500k’s! I am sure that town use will see close to 40k’s per litre. It has been my experience that small motors really come alive in terms of economy and performance after a couple of thousand kilometres. The test unit had only 500k’s on the clock. I would love to repeat this test after 3,000 odd kays. I think we would be even more astounded! It is pretty damn obvious that I like this bike. Are there any downs you might ask? Resplendent in either matt blue or red the Wolf is a looker. Tank and radiator cowl are reminiscent of a Honda CB1000R. The exhaust tailpipe is so so. (Perhaps only given one lash with the ugly stick). A 140/70-17 rear tyre and 110/70-17 front give the Wolf a purposeful stance, mounted on attractive tubeless mags. 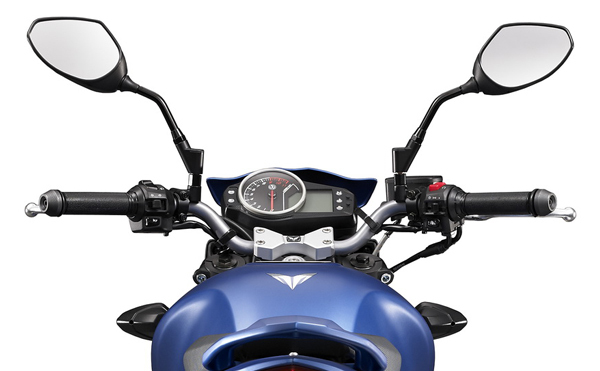 The instrument panel is dominated by a large analogue rev counter with digital speedo, fuel gauge and trip meters. General fit and finish are up to Syms’ normal decent standards. 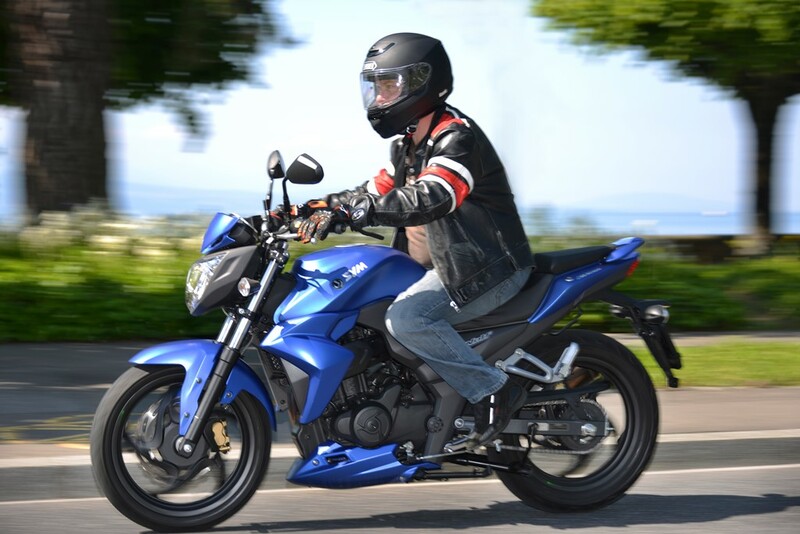 The Sym Wolf SB250Ni is a fine motorcycle, and the first really viable 250 commuter. It is fast enough, comfortable, and a hoot to ride. It accelerates with genuine torquey thrust with respectable top end hit. It would make an excellent commercial unit and is a very viable commuter guaranteed to slash your commuting time and costs. The price of R 58,999 is a little steep but we have Zuma and an ailing rand to thank for that. Factor in the savings after a couple of years commuting and it starts to look like a bargain. Then of course there is the fun factor. How do you put a price on that? Looking back at a successful Kawasaki Press Conference at EICMA in Milano. The 5.077km long Motorland Aragon circuit hosted a two-day test session for the official Kawasaki Racing Team and its riders Jonathan Rea and Tom Sykes, with Rea going fastest and Sykes the second rider on the unofficial timesheets. Held between 16 and 17 November the test was the most significant yet as the team started to make the transition between the official 2016 machine and the new for 2017 Kawasaki Ninja ZX-10RR. With a new Ninja to race winter testing will take on a whole new level of importance from now until the first round of the new season, to be held in Australia in February. Rea, who set fewer laps on day one than on day two, left Motorland with the fastest lap time of all. His 1’49.8, which is relatively close to the track best, was well under the official race lap record of 1’50.421. Sykes put in 150 laps of Motorland over two days. While using harder SC1 tyres he set a best of 1’50.4, which was the second fastest time of the test and almost exactly on lap record pace. After working with some new engine specifications Sykes moved on to work on his chassis and suspension, all the while with a race set-up on his Ninja. With a stated aim of going 1-2 in the championship again in 2017 the KRT squad has made a very strong first real step into a future that again promises much for riders, team and Kawasaki as a manufacturer. Next up for all in the team is another Spanish test, this time at Jerez de la Frontera, starting on 21 November. Four days of track action are planned in all. The opening MotoGP™ test of 2017 has been completed at the Ricardo Tormo circuit in Valencia with the first appearance of Suzuki’s new Factory riders, Andrea Iannone and Alex Rins; and after the positive outcome of yesterday, today was more complicated for Team SUZUKI ECSTAR due to crashes from both riders. Team Suzuki Press Office – November 16. First was Rins, who fell this morning at turn 12 because of the loss of the front-end on his GSX-RR. After a first check on-track, he was transferred to the circuit’s ‘Medical Center’ for further checks, where he complained of a lot of pain. For this reason, he was transferred to “Hospital 9 de Octubre” in Valencia for further investigation. He hasn’t suffered major injuries, but he has lesions on thoracic vertebra T8 and T12. He will now remain in hospital for further medical checks and will probably be transferred to Barcelona tomorrow for further medical checks, but his injury is likely to force the young Spaniard to take a month off. A similar crash at the same spot affected Iannone’s performance, and he suffered pain to his right elbow. But his determination to get back to testing the new machine helped him overcome this; although his performance was not at 100%. Despite this, he completed many laps in the afternoon and gave important feedback to the engineers and his crew that will be helpful to determine the future-development of the Factory GSX-RR and preparation for next week’s test. Team SUZUKI ECSTAR will have a private testing session at Jerez, from Wednesday to Friday, deploying Andrea Iannone and Suzuki Test Team Rider Takuya Tsuda. “Overall the test was quite positive but today we had some incidents that interrupted the working plan. Alex crashed this morning and suffered a crush in a couple of vertebra and it seems he should rest for at least three weeks or one month. He will not be at Jerez next week for the private test so we should wait until Sepang. It’s a pity because we have lost a bit of time, but the important thing now is he rests as much as possible. Now we wish him the best recovery and we will meet him again in Sepang.